We don’t simply sponsor world-class teams and athletes, we work extremely closely with them and use their expertise and feedback to help us develop the next range of products. This, combined with our passionate commitment to innovative design, research and development, materials and manufacturing processes, ensures we deliver technically superior components that deliver the ultimate performance that riders demand, and all at competitive prices. The new Vision TriMax 30 Disc Brake Wheel is available as a tubeless-ready clincher wheel and is light and versatile, weighing only 1,590 grams. These wheels are suitable to be used on the road (both for training or performance) and in gravel for cyclocross and are ready for any condition. The exclusive milling of the rim on the surface between one spoke and the other (Inter Spoke Milling) helps reduce weight by increasing wheel agility and facilitating uphill action. 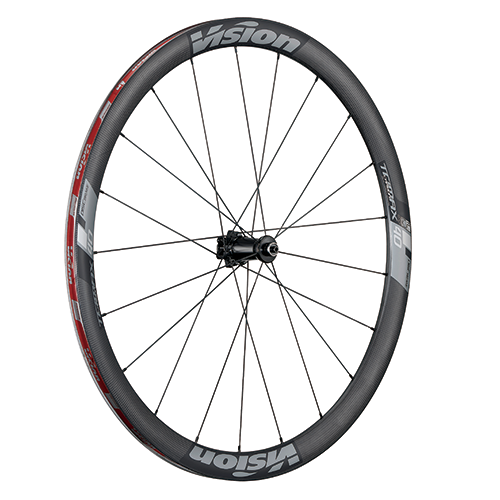 Vision has paid close attention to the needs of athletes, offering an internal edge of 19mm that allows for a more comfortable ride. Thanks to the high reliability of the rim and aluminium hubs of the TriMax range, this wheelset provides a stellar performance for any cyclist and at a great price. The TriMax Carbon 40 CSI Disc Brake Wheel is available as a tubeless-ready carbon clincher wheel with an elegant and versatile design, weighing a total of 1,750 grams.. They are suited for cyclists in search of a high aerodynamic performance on both flat and mixed terrains. Thanks to the exclusive construction of the CSI (Carbon Structural Integration) rim, the carbon integrates with the load-bearing and resistant aluminium structure, giving the wheel an appearance without compromising performance. Vision has paid close attention to the needs of athletes, offering an internal edge of 19mm that allows for a more comfortable ride. Thanks to the high reliability of the rim and aluminium hubs of the TriMax range, this wheelset provides a stellar performance for any cyclist and at a great price. Metron 6D Integrated Handlebar is an extremely rigid and aerodynamic handlebar with an integrated attachment system. Its innovative shape includes our Aero-Ergo central section. The reinforced carbon fibre construction also offers an excellent strength-to-weight ratio. This handlebar allows the internal passage of the cables, with guides that allow the wiring for an electronic gearbox. Metron 4D Flat M.A.S. 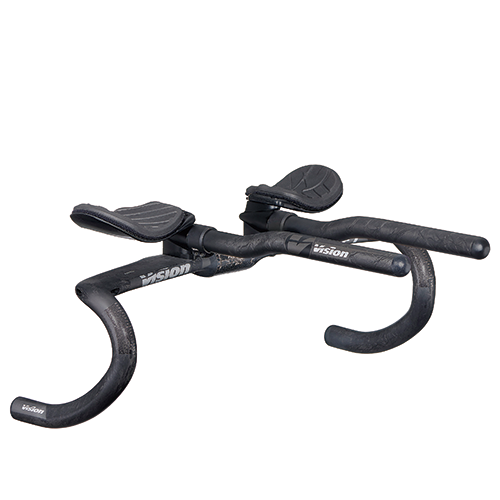 Handlebar combines the excellent ergonomics and aerodynamics of the beloved classic Metron 4D bar. With a lower hand position and an innovative and optional direct clip Modular Aero System (MAS), this bar offers even greater versatility. Latest news and guidelines, Athletes and Teams results, technical and emotional videos about the community VISION WORLD. Do you like the VISION WORLD? Check-out our social media here.